One day early in our life with Bella, within the first couple of weeks of getting her, Jan and I took her to a local trail where she could get some exercise and maybe meet some dogs in a safe, controlled way. Lots of dogs and their owners walk here and most have their dogs under voice control if not on a leash outright. But it's a wooded trail that winds and twists and you can't always see what's around the corner. Part way into our walk, we came to a corner that had a big, bounding dog running around it. A big, bounding Pitbull. Off-leash. No collar. And no owners in sight. Heading straight towards us. And we with our scared-y dog - presently straining at the end of the leash behind me and just a blink away from getting out of her collar to escape the big, bounding dog. And I admit it, we spooked. Both Jan and I reacted immediately and strongly out of fear of this dog potentially hurting our pup. While I scurried to gather Bella up in my arms, Jan stood between us and the approaching dog, arms spread to appear as big as possible and yelled a warning to the dog to stop. To our utter amazement and eternal gratitude, she did. Finally, her owners came around the corner and introductions were made. She was a beautiful blue and white American Pit Bull Terrier a few years old. She had excellent dog greeting skills and I was truly embarrassed at our own little ruffian's bad manners when she snipped at the greeting. In true Pittie fashion, the beautiful stranger just snuffed and walked away not interested in playing with the snarky little pup any more. You're probably wondering why I'm telling you this now. Well, today is Corbin's, of "Oh Corbin" fame, third birthday and for his birthday gift, he has asked folks here in Blogville to say a little something about Pitbulls. When I first heard about Corbin's birthday wish, I mulled over a bunch of different ways to approach the topic. I could write about the many bully breed dogs we met when we used to visit the Tufts Farm Field or at different dog-centered events we attend. I could recall how I used to jump at the chance to walk the bully breeds at my local shelter because they were always the sweetest, cuddliest creatures in the kennel. Or maybe I should write about the horrid and inhumane breed-specific legislation popping up all over the country? I could talk about how breed stereotypes are hurting beautiful dogs like Ed who sit waiting in shelters for someone to look beyond appearance and recognize them for the beautiful souls they are. But when I thought about that one unexpected encounter we had in our history with Bella, I couldn't get out of my head how we reacted without thinking. How, even though we knew better, our feelings were still influenced by the non-stop media barrage that paints these dogs as dangerous and inherently vicious. Yes, we can try and excuse our feelings by saying the dog was off-leash, had no collar and no owners in sight. But let's be honest, would we really have reacted the same way had the approaching dog been a Golden Retriever? If it's hard even as dog-lovers for Jan and I to let go of the fear being instilled in us by this insidious media campaign against Pitbulls, what can we expect of the average person or worse, those who are afraid of or dislike all dogs to begin with? And how do we reach those folks to overcome the media myth? Campaigns like this one Corbin is running and the many Facebook groups and blogs that have formed to present a positive pit bull image are a great start. Even better are the meet-up groups like the Chicago-based SociaBulls and Vancouver's HugABull that get the dogs out in front of people and give them a chance to interact with the community. We need to do anything and everything we can to get these beautiful dogs, real animals, real family members, out in front of people so they can interact with them and see for themselves they are not the monsters the media is trying to make them out to be. Because once you've actually put a face to the name, it becomes harder to devalue the individual soul you're talking about 'eliminating'. And it becomes easier to discount what the media is selling. And when you know these dogs, when you look into their eyes, it becomes impossible to imagine a world without them. We truly hope one day you and all your brethren will be allowed to live in peace again. Thank you, Leslie, for saying what so many of us find too difficult to admit. It's not as simple as we often state - we are all affected to one degree or another by what we've seen and heard, and those impressions lie within us whether we like it or not. I believe we will get to the point where these biased views and reactions will subside. But it will take a concerted effort, and time. And okay... I'll own up as well to having had the same sort of reaction. In spite of "knowing better". What a wonderful post, I know Corbin loved it! The sad thing, which is so predominant in this society is that a certain few people, who mistreat their dogs, have encouraged the discrimination of this breed. I love all dogs, but I'd be a fool to say that if I were to encounter a situation such as you described, that I wouldn't at least be cautious. I would be cautious if it was a small dog too, because you should be cautious around dogs you don't know. The owners of that dog at the very least should have had a collar on the dog. I'm glad that the situation had a good outcome. I love how many folks who don't have pitties are participating in this. I completely missed the boat, as per usual, but I'm loving what I'm reading. Thank you for being honest, although it's always smart to be cautious around a loose dog of any kind. Maybe it's because I've always known someone with a pit mix--or other bully breed--of some sort that I've never had the negative association with these dogs, but not everyone is so lucky. I am pretty nervous about any dog, who is alone, coming up to us when where walking because of the fact that Trinity was attacked when she was a baby by a dog down the street from us (she was ok, I was the one shaken up). I hate it when an off leash dog comes up to us if she's on leash, she feels my nervousness. But taking precautions is never a bad thing, you never know how they will react to your dog. I think even if it was a golden retriever I still would have been nervous. Loved reading this post and the video was just so sweet!! I love meeting all Dogs no matter what the breed, but my Mum does get a little nervous if we meet one that doesn't appear to be with anyone, because if something were to happen my Mum wouldn't want to be the only one dealing with both Dogs (and often my buddy Cosmo) - I think no matter what the breed humans shouldn't let their Dogs get too far away from them if they're off leash…..
What a great post! :D Corbin will be so happy when he reads it! PeeS: Mom is always leery of any dog we may see that is off leash. We do our best to avoid them whenever possible. I am sure many of us have had the same reaction in similar situations. I will have to get Mr to tell his story some time. I'm slow getting caught up but I think this is my favorite Pittie Post. It's so honest. And yes, change has to start inside each one of us. It's also very timely as I'm working on a post I've tentatively named "When Golden Retrievers Attack..." You're right that pit bulls are judged more harshly for behavior that could come from any dog. 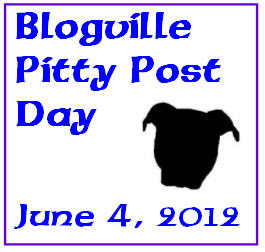 This is a fantastic post for Pittie Post Day. I have occasionally had similar emotional reactions even when I know intellectually that the perception is not reality. Well said. I walked many bully breeds at our shelter for the 8 1/2 years I was a volunteer there. Like you, I found pibbles to be quite cuddly and affectionate. My favorite was a little guy named Thor. He was an awesome dog. but, when I was a pet sitter I was charged twice by pitbulls in two different circumstances when they escaped their yards. I am sad to say that I too had the same reaction. Initially. In both cases, I used some advice I remembered another pet sitter had shared with me. Yell at them to GO Home! Both times it worked. In the first case, the female gave a disappointed whine and ran home. In the second, the scared pup barked at me and took a fearful stance, but did not charge. She went home too. Later, I reflected on both incidences and how my mind immediately went to fear because of the breed of dog coming at me. We all have a lot to learn and to share. SO glad you shared your story. I think admitting it is helpful for everyone.